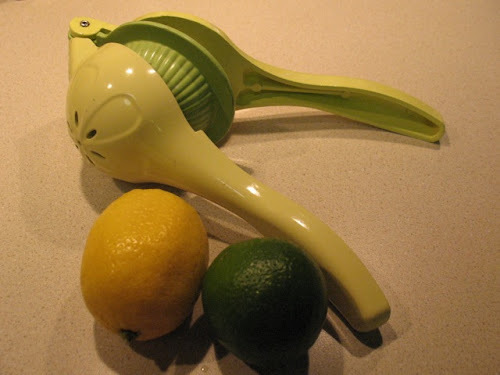 To some, a citrus juicer may not seem like essential kitchen equipment. If you don't make a lot of things with fresh lemon or lime juice, perhaps it's not for you. But for me, it's absolutely great. I use fresh citrus juice frequently in cocktails as well as many recipes (including all three recipes I'm posting this week). This tool saves time, mess and waste. There's really no downside. Trying to squeeze citrus with your bare hands can be tiring; this gives you good leverage to work quickly. By hand, you often end up squirting on the counter, on the wall or even in your eye (ouch). This is designed to contain the squirt and drain the juice only where you want it. The green middle piece allows you to size the inner bowl to make a better fit for lemons or limes, so there's little "unsqueezed" juice left in the fruit. Plus it's just really efficient. You can juice your way through a whole basket of citrus in no time, without having to roll them on the counter or microwave them to get a good result. I'm glad you enjoy this device. The only time I handle it is when I wash it and put it away. It sure takes a long time to dry!